G’day, forex mates! Another Australian jobs report will be released tomorrow (Nov. 16, 12:30 am GMT), which means that the Aussie will likely get a volatility infusion. And if you want to trade this top-tier event and need to get up to speed on what happened last time and what’s expected to happen this time, then you better read up on today’s Event Preview. The Australian economy generated 19.8K jobs back in September, which is more than the consensus that jobs would grow by 15.0K. The details of the jobs report were also pretty upbeat since full-time employment increased by 6.1K. And this was supplemented by the 13.7K increase in part-time jobs. 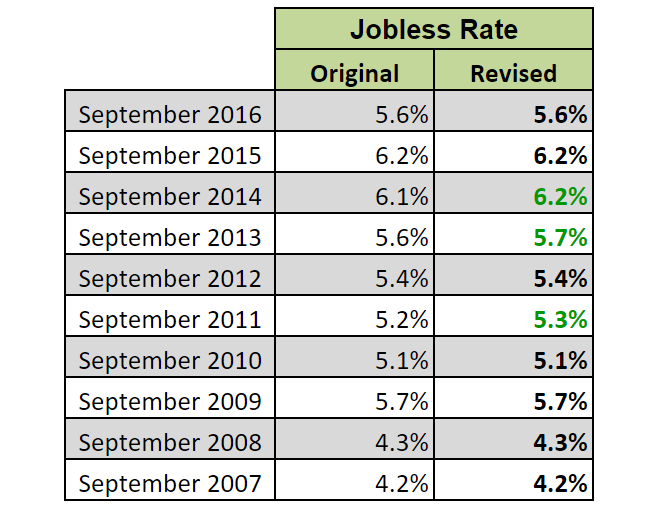 Moreover, the jobless rate improved from 5.6% to 5.5%, which is the best reading since May of this year. And it’s a healthy dip in the jobless rate since the dip was due to the number of unemployed blokes and sheilas falliung from 727K to 711K, given that the labor force participation rate held steady at 65.2%, which is the shared highest reading in 21 months. The only disappointment from the September jobs report was the revelation that jobs growth in August was downgraded from +54.2K to +53.0K. Overall, however, Australia’s September jobs report was positive, which is why the Aussie jumped higher. However, gold was sliding at the time, so there was little follow-through demand after the jobs report and the Aussie was forced to give back its gains on most pairs. There’s no true conensus on jobs growth, but most forecasts by market analysts generally fall within the +17.5K to +18.8K range. So, what do the leading indicators and related economic reports have to say? Well, AIG’s performance of manufacturing index (PMI) dropped from 54.2 to a 13-month low of 51.1. However, the employment sub-index slightly improved from 52.4 to 53.2, thanks mainly to higher payroll numbers in the food and beverages sub-sector. Next, AIG’s performance of construction index (PCI) also deteriorated from 54.7 to a six-month low of 53.2. Unlike the PMI, however, the PCI report showed the employment sub-index for the construction sector also deteriorated by 3.0 points to 52.4. The reading is still above the 50.0 neutral level, so employment in the construction continued to grow, albeit at a weaker pace compared to September. Moving on, AIG’s performance of services index (PSI) fell from 52.1 to a seven-month low of 51.4. However, the employment sub-index for the labor-intensive service sector jumped from 51.4 to 53.3, which means that jobs growth accelerated. As for the employment index from the National Australia Bank’s (NAB) most recent Monthly Business Survey, it held steady at 7 index points, which means that jobs growth in October roughly matched jobs growth back in September. Fianlly, let’s take a look at historical trends. Do they provide any additional insights? 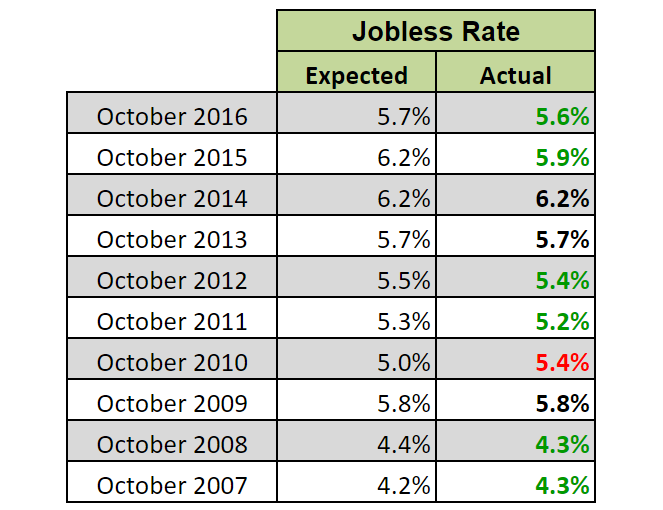 Well, yes, since economists historically have a tendency to be too optimistic and undershoot their guesstimates for net employment change in October. As such, there have been more upside surprises in the past 10 years. Also, the smoothing effect of seasonal adjustments mean that the previous reading usually gets an upgrade. And let me stress the word “usually” here because there have been downgrades as well, with September 2016’s downgrade being rather significant, so keep on your toes. Another noteworthy historical tendency is that the actual reading for the jobless rate tends to beat expectations, which again highlights how pessimistic economists are with their guesstimates. Yet another historical tendency is that the previous reading usually holds fast, but there have also been some upgrades (and no downgrades) in the past 10 years. 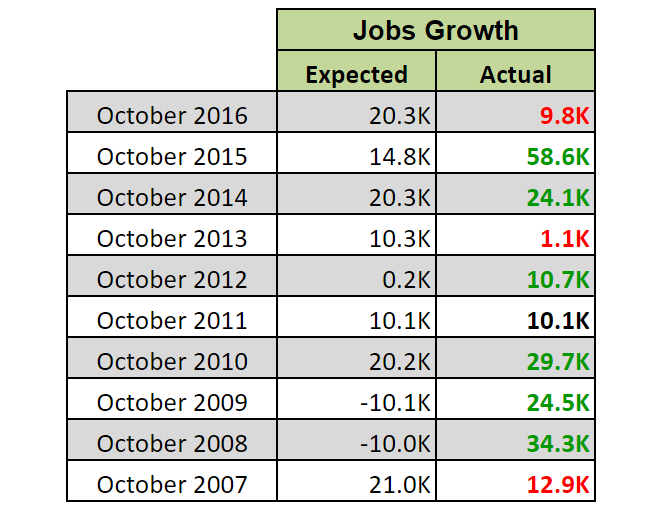 To summarize, the available leading indicators are mixed but they imply that jobs growth in October either matched or was stronger compared to September. However, this is contrary to the forecasts of most analysts that the Australian economy only generated between +17.5K to +18.8K jobs, which are weaker estimates for jobs growth compared to the +19.8K jobs generated back in September. And historically, economists have been too pessimistic with their guesstimates, which has resulted in more upside surprises for both jobs growth and the jobless rate, so probability appears skewed more towards an upside surprise for both labor indicators. However, just remember that we’re playing with probabilities here, so there’s always a chance that the readings may print a downside surprise instead. In any case, just keep in mind that better-than-expected readings for net employment change generally triggers a quick the Aussie rally. And the Aussie’s bullish reaction to the previous jobs report is a textbook example of this. But on the flip side, a miss usually results in the Aussie getting dumped. For follow-through buying or selling, forex traders used to look at the other labor indicators, namely the jobless rate, full-time employment, and the participation rate. However, the Aussie has returned to tracking gold prices recently, so it would probably be prudent to keep an eye on gold prices as well. Remember, the previous jobs report was positive overall but the Aussie ended up surrendering its gains because gold was in decline at the time. Oh, if you don’t know, you can check slightly delayed gold prices in our Live Market Rates. Or if you prefer real-time data, you can go here.